Flip phones are a hard sell in the Era of the Smartphone, sure, but there's still something undeniably charming about an old-school hinged handset. 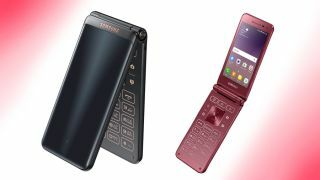 For those longing for the designs of old, Samsung is launching the Samsung Folder 2 — a sleek, two-screened flip phone that supports the not-so-ancient Android 6.0 Marshmallow operating system. For the price of 297,000 won (about $260, £205, AU$345), the Galaxy Folder 2 comes with 2GB of RAM, a 1.4GHz quad-core processor, a microSD slot for storage up to 256GB, and a removable 1,950mAh battery. While it's easy to see the appeal in Samsung's slick new flip phone, obtaining one will be much more difficult. Like its predecessor, the Galaxy Folder 2 is a South Korean exclusive, with a worldwide release looking unlikely. A shame, too — we've drooled over Samsung's flip phones in the past, finding they'd make great options for those who miss the simplicity (and tactile keys) of folding phones. If the nostalgia-fueled relaunch of the Nokia 3310 was any indication, now may be as good a time as any for retro mobiles to make a comeback. Just saying, Samsung.